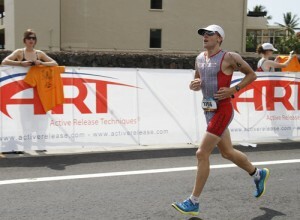 Our Apple Valley Dentist, Dr. Bennett Isabella, Completes Ironman World Championship! For a “championship” smile, take advantage of our professional teeth whitening dental services at our lowest fee ever! Dakota Dental’s own, Dr. Bennett Isabella, (a family dentist in Apple Valley, MN) recently participated in the very grueling Ironman World Championship in Kona, Hawaii. Renowned for its demanding three-part course, this televised athletic event is one that many dream of, but for which very few qualify. Dr. Isabella was cleared to enter the Ir­­­­­onman World Championship after successfully finishing the Florida Ironman Triathlon within the top three of his age group. On the morning of October 13, 2012, Dr. Isabella began the triathlon with 1,900 other competitors. According to Dr. Isabella, the 2.4 mile swim in open water was tough. “It seemed I was accidently put into a washing machine,” he said. “I am not the greatest swimmer anyway, so it made it extra rough when I was pushed down every few minutes by flailing arms.” In the end, he finished the swim in one hour and nine minutes—about four minutes slower than he had hoped. Next, this Dakota Dental Apple Valley Dentist began biking 112 miles on a very hot, very windy, and very hilly course. Dr. Isabella, a fairly strong biker, struggled with overheating and leg cramping after the first 40 miles; but he pushed through to finish with a time of five hours and six minutes. With temperatures ranging between 110 and 120 degrees, Dr. Isabella began the 26.2 marathon. Battling side aches and heat exhaustion, Dr. Isabella packed his hat and pants with ice to keep going. Soon, the extreme fatigue had him wanting to simply walk off the course. But, with the goal to just reach the next aid station, he kept going. Finally, he reached the last mile and was greeted with cheering onlookers. He finished with an official time of 9:56:35—under his goal of 10 hours! With that same steadfast commitment demonstrated within the Ironman World Championship competition, your family dentist at Dakota Dental Apple Valley dentistry will perform all of your general dental services as well as cosmetic dentistry, emergency dental services and pediatric dentistry – with the highest level of integrity and skill. You can feel completely confident as a patient at Dakota Dental Family Dentistry, that your dental health is in the hands of a real champion! And for a “championship” smile, be sure to take advantage of our professional teeth whitening dental services at our lowest fee ever – now only $185 (normally $450)!